The interior is clean and exudes classy elegance. Virtually every piece of marine electronics is duplicated on the bridge. 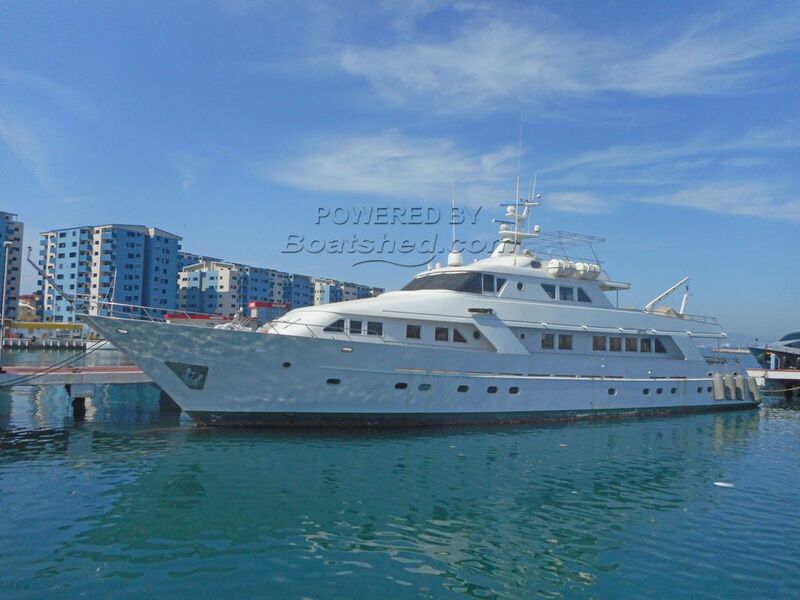 This is a three deck super yacht which has just been reduced in price in order to achieve a quick sale. Her interior is in very good condition. Her exterior needs some attention. In order to facilitate any evaluation on the part of potential purchasers the vendors have commissioned a pre-purchase survey from an independent marine surveyor. This survey can be made available to potential purchasers. The vendors have also carried out a programme of under the waterline work to secure the vessel. These works include servicing of seacocks, servicing of other through the hull fittings, shafts, propellers, hull repairs, new anodes and anti-fouling. At the time of writing (last week of March 2018) the vessel is ashore. She went through successful sea trials at the end of April. We can arrange viewings ashore and participation in sea trials. This Benetti TSMY has been personally photographed and viewed by Lynda, Andrew & John of Boatshed Gibraltar. Click here for contact details.